Peter Capaldi, best known for playing foul-mouthed spin doctor Malcolm Tucker in political satire The Thick of It, has been named as the 12th actor to play the lead in TV series Doctor Who. The 55-year old Glasgow-born actor, a lifelong Doctor Who fan, is the oldest actor to play the Time Lord since the first Doctor, William Hartnell, in 1963. He will replace Matt Smith, the youngest ever Doctor at 26 when he was introduced in 2009. The new Doctor was announced in a special live broadcast on BBC1 last night. 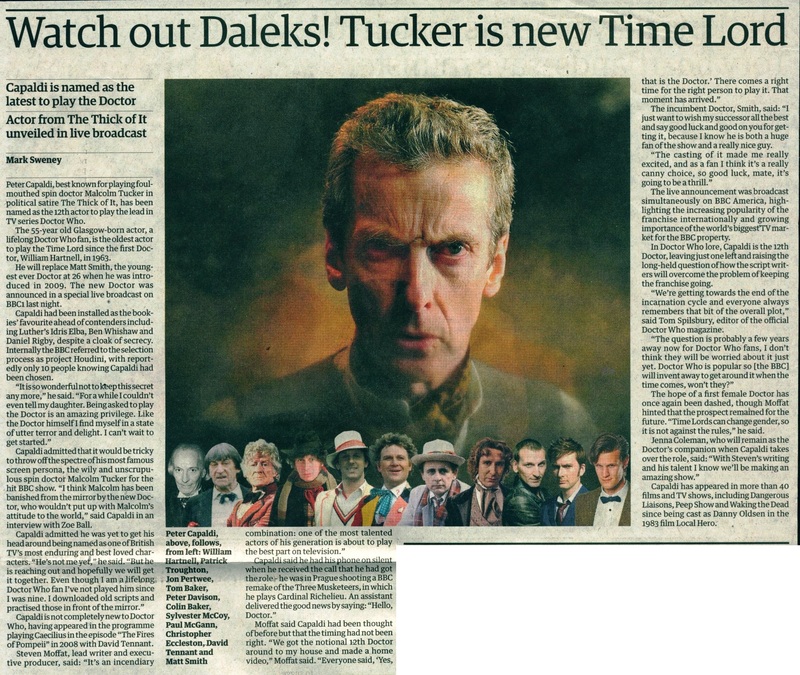 Capaldi had been installed as the bookies' favourite ahead of contenders including Luther's Idris Elba, Ben Whishaw and Daniel Rigby, despite a cloak of secrecy. Internally the BBC referred to the selection process as project Houdini, with reportedly only 10 people knowing Capaldi had been chosen. "It is so wonderful not to keep this secret any more," he said. "For a while I couldn't even tell my daughter. Being asked to play the Doctor is an amazing privilege. Like the Doctor himself I find myself in a state of utter terror and delight. I can't wait to get started." Capaldi admitted that it would be tricky to throw off the spectre of his most famous screen persona, the wily and unscrupulous spin doctor Malcolm Tucker for the hit BBC show. "I think Malcolm has been banished from the mirror by the new Doctor, who wouldn't put up with Malcolm's attitude to the world," said Capaldi in an interview with Zoe Ball. Capaldi admitted he was yet to get his head around being named as one of British TV's most enduring and best loved characters. "He's not me yet," he said. "But he is reaching out and hopefully we will get it together. Even though I am a lifelong Doctor Who fan I've not played him since I was nine. I downloaded old scripts and practised those in front of the mirror." Capaldi is not completely new to Doctor Who, having appeared in the programme playing Caecilius in the episode "The Fires of Pompeii" in 2008 with David Tennant. Steven Moffat, lead writer and executive producer, said: "It's an incendiary combination: one of the most talented actors of his generation is about to play the best part on television." Capaldi said he had his phone on silent when he received the call that he had got the role - he was in Prague shooting a BBC remake of the Three Musketeers, in which he plays Cardinal Richelieu. An assistant delivered the good news by saying: "Hello, Doctor." Moffat said Capaldi had been thought of before but that the timing had not been right. "We got the notional 12th Doctor around to my house and made a home video," Moffat said. "Everyone said, 'Yes, that is the Doctor.' There comes a right time for the right person to play it. That moment has arrived." The incumbent Doctor, Smith, said: "I just want to wish my successor all the best and say good luck and good on you for getting it, because I know he is both a huge fan of the show and a really nice guy. "The casting of it made me really excited, and as a fan I think it's a really canny choice, so good luck, mate, it's going to be a thrill." The live announcement was broadcast simultaneously on BBC America, highlighting the increasing popularity of the franchise internationally and growing importance of the world's biggest TV market for the BBC property. In Doctor Who lore, Capaldi is the 12th Doctor, leaving just one left and raising the long-held question of how the script writers will overcome the problem of keeping the franchise going. "We're getting towards the end of the incarnation cycle and everyone always remembers that bit of the overall plot," said Tom Spilsbury, editor of the official Doctor Who magazine. "The question is probably a few years away now for Doctor Who fans, I don't think they will be worried about it just yet. Doctor Who is popular so (the BBC) will invent away to get around it when the time comes, won't they?" The hope of a first female Doctor has once again been dashed, though Moffat hinted that the prospect remained for the future. "Time Lords can change gender, so it is not against the rules," he said. Jenna Coleman, who will remain as the Doctor's companion when Capaldi takes over the role, said: "With Steven's writing and his talent I know we'll be making an amazing show." Capaldi has appeared in more than 40 films and TV shows, including Dangerous Liaisons, Peep Show and Waking the Dead since being cast as Danny Oldsen in the 1983 film Local Hero. APA 6th ed. : Sweney, Mark (2013-08-05). Watch out Daleks! Tucker is new Time Lord. The Guardian p. 3. MLA 7th ed. : Sweney, Mark. "Watch out Daleks! Tucker is new Time Lord." The Guardian [add city] 2013-08-05, 3. Print. Turabian: Sweney, Mark. "Watch out Daleks! Tucker is new Time Lord." The Guardian, 2013-08-05, section, 3 edition. This page was last modified on 11 February 2016, at 23:41.